Mike Miller — and Mike Miller's wife, even — was quick to shoot down any talk of retiring from the NBA after his performance in the series-clinching Game 5 of the NBA Finals on Thursday night. You can't blame us for wondering, though; because even if Miller was in his mid-20s and coming off a series of healthy seasons and a pain-free run through the postseason, who wouldn't want to go out on top after a game like this? The game went like this for the 32-year-old veteran: Twenty-three points in 23 minutes off the Miami bench, 7-8 shooting from long range, zero turnovers, a litany of good leak-ahead and extra passes (though he didn't register an assist) and five rebounds for one of the better rebounding guard/forwards of his generation. All paired with the oft-injured Miller clutching at his shorts between possessions, clearly pained from the back, wrist and whatever other injuries that have dogged him significantly over the last two seasons. How dogged was he, you ask? Well, 1970s-era Johnny Carson crowd, he played 80 out of a possible 148 regular-season games over the last two years, and he probably should have played in about half as many. Shot in the low 40s, percentage-wise, after shooting in the high 40s for the entirety of his career before signing with the Heat in the summer of 2010. Shot 37 percent in this postseason, entering Thursday night, and 34 percent in 2011's playoff run. Dude shot five free throws in the regular season this year. Five. He was, even in his career-defining moment in Thursday's Game 5, almost painful to watch as he worked his way up and down the court. The jumper, often spoon-fed to him by a focused and determined LeBron James (who finished with 13 assists), was true. Elbow under the ball, follow through, perfect form. And, in the grand and week-long tradition of LeBron finally getting help from teammates not named "Dwyane" or "Chris," Miller was the latest (following Shane Battier and Mario Chalmers) to give Miami the perimeter threat needed to make the Thunder pay when they smartly double-teamed the devastating James in the post. For his last few healthy years as a member of the Minnesota Timberwolves and Washington Wizards, Miller was rightfully criticized for passing up good shots to act as a point forward of sorts on teams that badly needed his scoring. Mindful of those all-around "limitations," though, the Heat signed Miller in the days following LeBron James, Dwyane Wade and Chris Bosh's agreements with Miami in what seemed like a perfect pairing. Miller could score and spread the floor — but he would spread the floor even without having to take a shot, just because opponents were mindful of his history. And even if he decided to keep attempting to force those passes, his ability to hit the open man or start the break with a defensive rebound would fit right in on a Heat team that would need a bit of everything, changing from game to game. Instead, his body fell apart. Miller had his moments, to be sure, but by and large he was a shell of himself as he attempted to work through killer wrist and thumb injuries in 2010-11 and back injuries this season. Even after a first-half barrage made him the subject of ABC's halftime interview in Game 5, Miller still seemed to skulk to the locker room. "Gingerly" doesn't describe it. Mike looked like he was trying not to break open his stitches. The barrage continued in the second half, when Miller scored 11 points as the Heat pulled away. Elbow under the ball, ready to work off of passes from LeBron from the corner that Battier had proved incapable of scoring from in the rounds prior to these Finals. Kismet — that tends to come easier when you're wide open, playing alongside one of the all-time greats. In the end, Miller had turned into the spot-up shooter that he warned pundits and scouts not to consider him as both in the months leading up to his selection in the 2000 draft, and in his years spent floating from Orlando to Memphis to Minny and his nation's capital. It didn't matter, though, because that's what role players on championship teams do. It means Chris Bosh, just two years removed from dropping nearly 25 a game, has to live life as a bailout specialist on offense and a (where did this come from?) defensive stalwart. It means Dwyane Wade, six years after single-handedly carrying this same franchise to its first title, has to get in where he fits in. It means LeBron James, even, has to modify his all-around game night to night to adapt to whatever the opposition throws at him and his teammates. 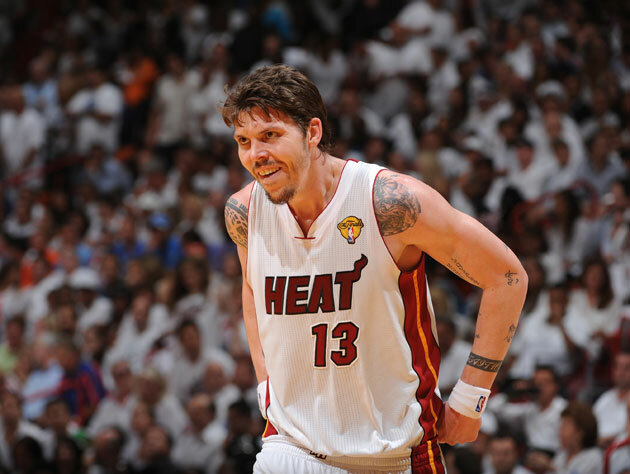 And Mike Miller, with his body crumbling, had to rely on what served his team best. The rebounds? Nice. The extra passes? Whatever, thanks. The Finals-clinching 3-pointers? Just what his team — his championship team — needed. And now he needs to feel no pain. A well earned bit of champagne, a championship cigar, and a few months in a hammock might aid Mike Miller in that pursuit.